At the end of December one of the local grocery stores in Chicago closed down. Along with the masses I purchased items, many that I didn’t really need, but some that I wanted to experiment with. I bought a bag of sweet peppers and while I thought I could use them for stir fry meals, there were too many of them and I was leaving in a couple of days for vacation. What do you do with food that you don’t want to go bad before going on vacation? You make soup! 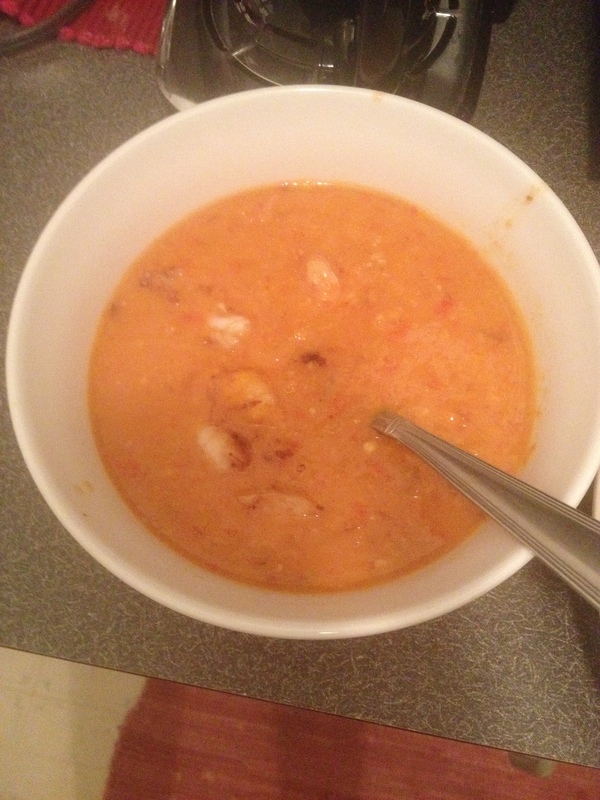 After searching Pinterest and making several tweaks I came up with the below recipe. 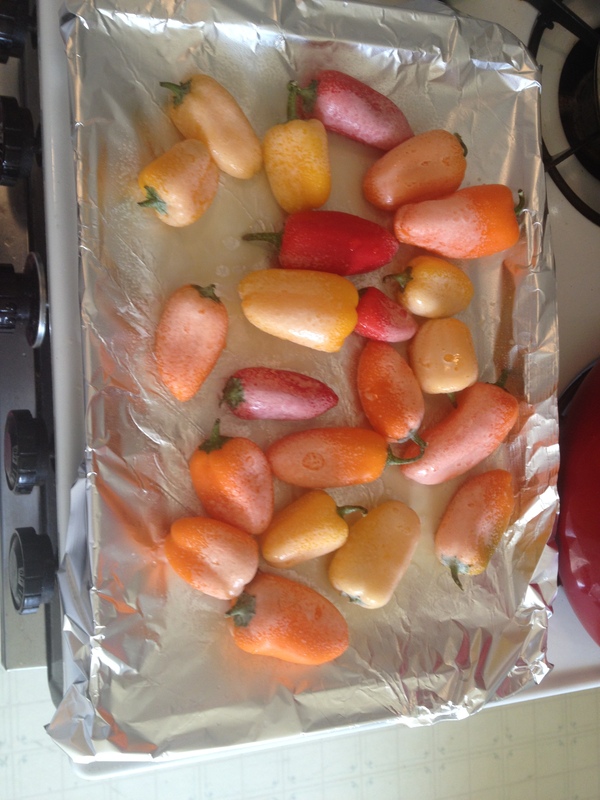 Place whole peppers on a baking sheet, spray with olive oil spray, and bake for 20-25 minutes. Allow the skins to blacken before turning them to blacken the other side. 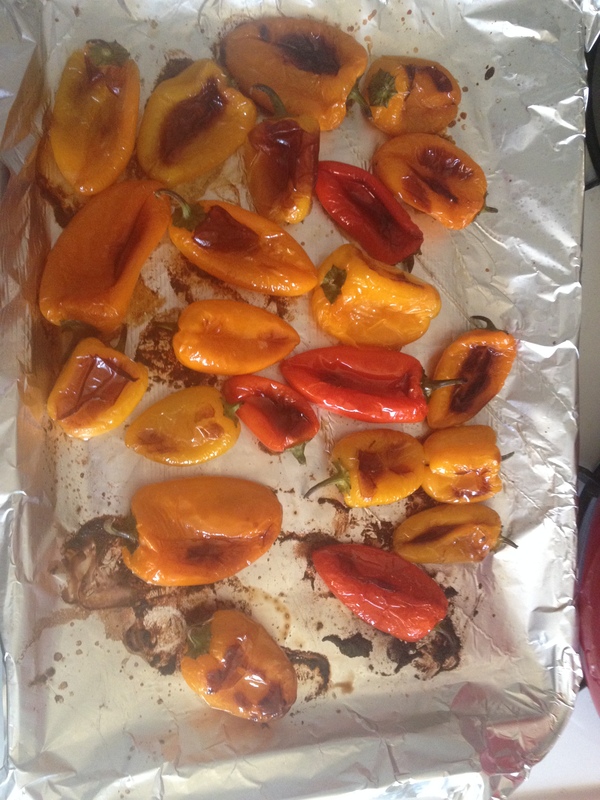 Remove the pan from the oven and allow to sit for 15-20 minutes, or until peppers are completely cool. Coarsely chop the peppers and set aside. Dispose of tops but keep everything else. Some recipes suggest getting rid of the pepper bits, the blackened bits and membranes but I think that adds an extra kick to the soup. Spray olive oil spray in a medium sauce pan over medium low heat, then add the onion and garlic and saute until transparent. Add the roasted peppers and stir to combine. Sprinkle the flour over the mixture and toss lightly, cooking for 2 minutes, but avoid browning. Stir in the vegetable stock and raise the heat to allow the mixture to come to a boil. Reduce the heat to low and allow to simmer for 20 minutes. Turn off heat and let cool for 20-30 minutes. In a food processor, blender, or with an immersion blender, carefully puree the warm mixture until smooth. Return to the sauce pan, stir in the light coconut milk, and allow to gently reheat. Most recipes call for milk, cream, and some even yogurt. I always replace with light coconut milk as it does exactly what cream needs to do but has a lot less calories and a different flavor. It could also be my Caribbean roots! Season with salt, cayenne pepper and any other seasonings to taste. If you want to add an additional flavor, you can also grill a couple of shrimp, chop up, and add as a garnish!